At Beijing in 2008, the British Paralympic team was very successful. The 42 gold, 29 silver, and 31 bronze medals prove the skill and commitment of disabled UK athletes. As with all athletes, however, disabled sports people often rely on grants to help them realise their potential. Government agencies, local bodies, and charities supply this much-needed funding. UK Sport is the body the government has set up to invest in talented athletes. The purpose is to improve British success in both the Olympic and Paralympic Games. UK Sport manages a lottery-funded scheme that extends twenty years into the future. The scheme allows the organisers of disability sport to bid for grants to offset the cost of holding major events. UK Sport also invites athletes to make personal applications. Funding for individual disabled athletes starts at £1,000. The highest awards – up to £8 million – go to the National Governing Bodies (NGBs) of key sports and apply over four years. UK Sport operates two grant schemes. Within these are set programmes and criteria. 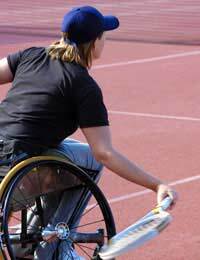 A disabled athlete or disability sport NGB must meet these before receiving a grant award. UK Sport has further details. TASS is the UK’s Talented Athlete Scholarship Scheme. The scheme’s aim is to help athletes make the transition from grass roots sport to the world sporting stage. To receive a grant, a disabled athlete must have the nomination of his or her sport’s NGB or a higher educational institute. In addition, athletes must hold a British passport; be in some form of education; and be able to take a place in the national team. TASS grants apply from 30th September each year to the beginning of October the following year. A successful grant applicant must sign a contract and adhere to its terms and conditions. Sports with TASS-supported athletes include disability cricket; disability powerlifting; disability swimming; wheelchair basketball; and wheelchair tennis. UK Sport and TASS are national schemes. There are also local programmes run by a variety of organisations. Their general purpose is to provide grants to support athletes from a given area. One example of such a locally-based scheme is in the south-west of the country. It offers athletes the chance to apply for cash funding to assist with training, travelling and equipment. Athletes also receive a free pass to certain sports and leisure centres in the area; free legal advice if necessary; and access to high performance facilities at a local university. To qualify, athletes must live in the area; be involved with a nationally-recognised sport; and have a proven need for financial support. With this particular scheme, disabled athletes must fall within a 12-35 age range. A good starting point for learning about such disability sport grants is to contact the local council. There are charities around the UK that support athletes with grants and advice. These charities do not discriminate between able-bodied and disabled sports people. It’s therefore worth asking to see their terms and conditions for grant awards. The sports and leisure department of the local council may have contact details. A charity that works nationally and for the benefit of disabled athletes is the British Paralympic Association (BPA). The BPA funds and manages the teams of the British Paralympic Games, and will answer enquiries about entering Paralympic sport. HI I coach a football team for disabledguys and girls who play the game usingbattery powered electric sport wheelchairsand we have lots ofkids come along who want join the club and learn to play but I do not have enough power chairs for them to usethis is a national sport with both a premier and championship league a national side who compete the world cup and we hope inthe not to distant future to become a Olympic sport.so I need to raise funds for more chairs where can I go? After spending a year with operations and in great pain with Knees back and shoulder, I was just about ready to start taking my 8 year old son fishing again. The reason we stopped I said was that he had to be able to swim at least 50 yards. Xmas he presented me his certificate and was excited that fishing was once more on the cards. We agreed that we would get Easter out of the way and then start.You cant believe 3 weeks ago someone broke into my garage and took everything. He's so upset what a bloody low life!!!!!! We are a parent led charity for children and Young people with Down's Syndrome. We have as swimming club once a fortnight teaching our children young people/adults with Down's how to swim and improving their skills. We use a local hydro pool. We are in urgent need of a grant to keep this group going as it is now costing so much more to run. Please is there any grants out there we can apply for. I am the only disabled (physically) member of Luton Judo Club and I am a Bronze medal winner at the British Closed Championships in 2009.My club is headed up by Chris Hobbs 5tth Dan and the club has had the most amazing success this year.We have won 3 commonwealth championship medals this year alone and the help they give to me as disabled judo player is massive.If we as a club could qualify for any kind of grant for judo equipment/courses that would be of huge help to the development of the younger judo players coming through. I am a below knee amputee 40 years old only having my surgery last year (2010) I take it is too late for such an old man to get any help in trying to get fit with a grant from any charity body.it has not been a good year of recovery and now at last i can get into some sort of shape but alas I am no good for the paralympics and so will continue to suffer in silence without help from anyone.how can the older generation be expected to become involved when we are too old to be considered for any help i am not asking to become a gold medalist I just want some help in getting back into the world and enjoy myself.